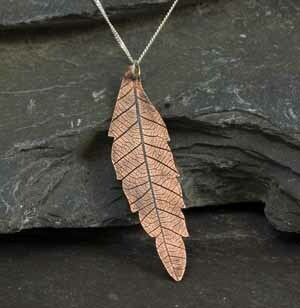 This leaf pendant has highlighted dark veins as a real leaf might have. It hangs from a 40cm silver chain. It can also be ordered with a longer chain. 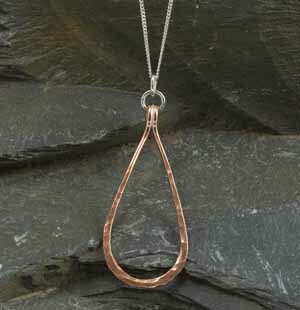 The pendant has a hammered finish polished to a high shine which resembles rose gold. It hangs from a 45cm silver chain. 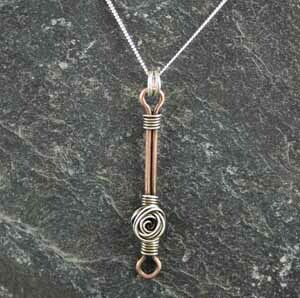 A copper pendant wrapped with silver wire in the style of a rosebud. It hangs from a 40cm silver chain.